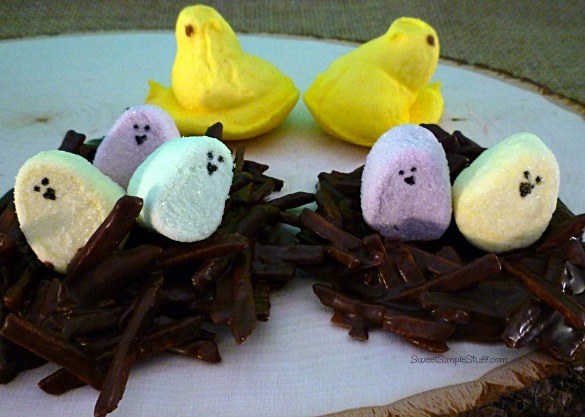 Mr. & Mrs. Peep met … fell in love … married … set up house nest keeping … marshmallow babies eggs magically appeared in the nest … the eggs hatched … giving life to the sweetest little marshmallow chicks … they all lived happily ever after … the end! 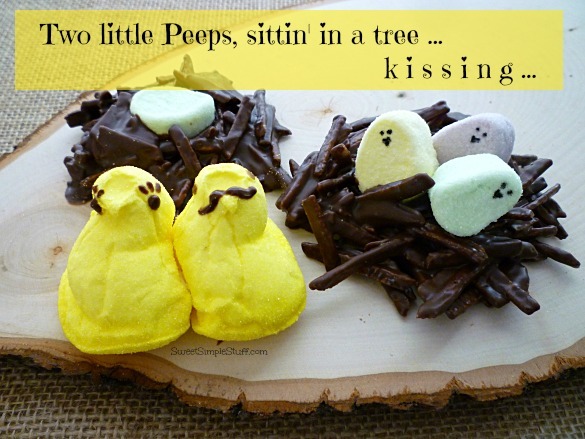 That’s my story and I’m stickin’ to it 😉 Pssst … I know that they really ended up in Easter baskets! 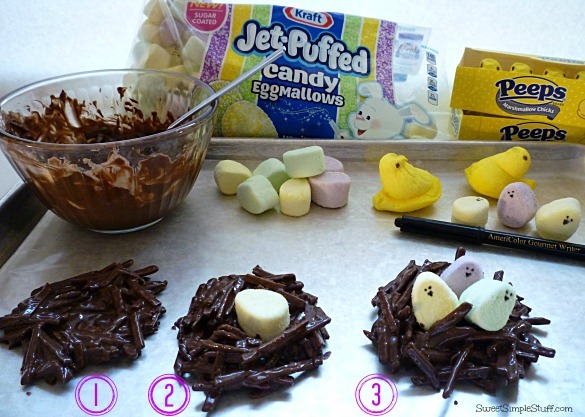 Let me explain how this all makes sense to me … Peeps are soft marshmallows with a sugar-coating … these little Eggmallows are marshmallows with a sugar-coating … therefore, the two must be related! 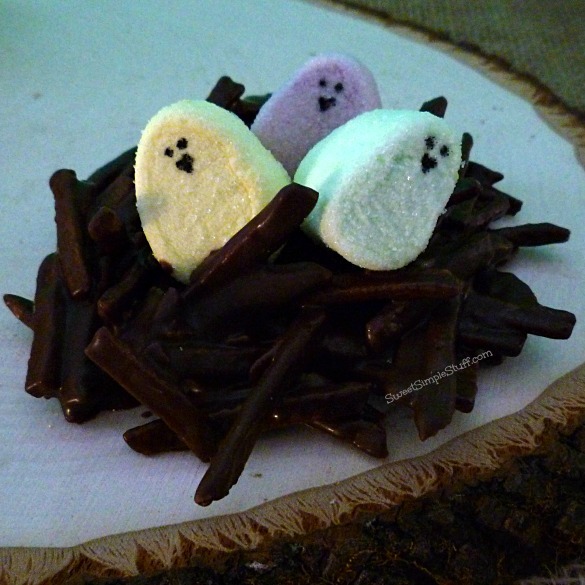 I hope you remember the Sweet and Salty Potato Stix Stacks … perfect nesting material for Peeps! Is my story making any sense? According to my family … I may be loosing it … the real question is … did I ever have it? Melt the chocolate according to the directions on the package. Mix in about 3 cups of potatoes, drop spoonfuls on waxed paper. Use a spoon to create a nest with a well in the center. If you have extra chocolate at the bottom of the bowl, mix in some more potatoes! Use the marker to draw eyes and beak on eggs and stand them up in the nest, then chill. 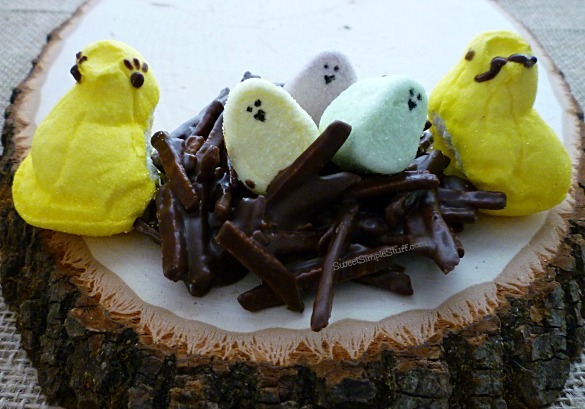 (not in photo) I used a toothpick dipped in chocolate to draw a moustache on Mr. Peep and eyelashes on Mrs. Peep. My words … “Mom is always right!” When will they ever learn? 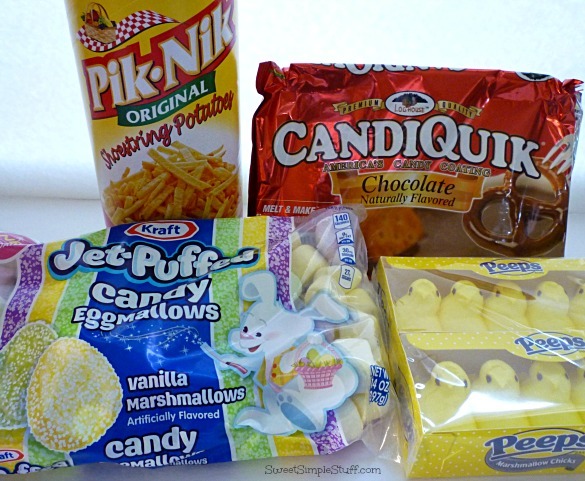 Are you a Peep lover? A sweet and salty lover? Do you believe my story? Did I ever have it? I do ♥ your comments! You are too funny! I’m laughing with you, not at you. I love your imagination. Yes I do like peeps very much & I love your Imagination. I wish that I could come up with stuff the way that you do.I love the idea of the shoestring potato sticks dipped in chocolate. Thank you Anna 🙂 I wish that you could talk to my family and verify that I’m not totally crazy! Love your peeps story. They look utterly delicious and so cute. You do have a big imagination and I like it. Thank you Ellen 😉 I also like to imagine that I’m thin and rich … so not true! 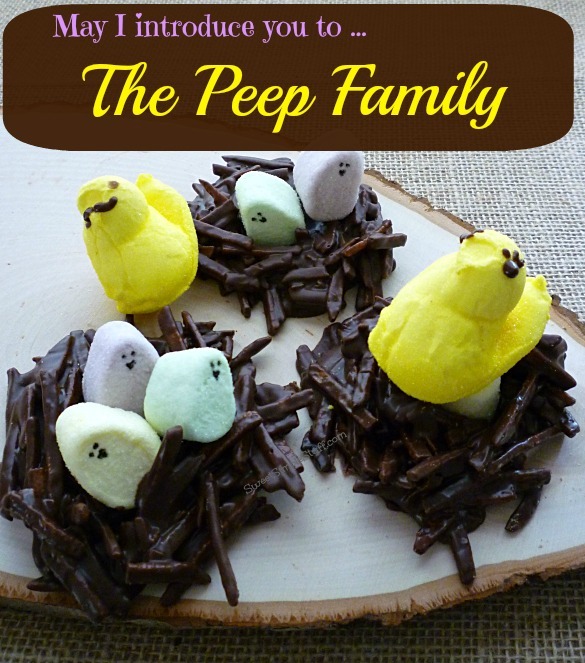 The peeps origin is as much a part of the natural world as anything else, so I believe your story is true. Your are not crazy and well, being “normal” is highly overrated and boring. LONG LIVE THE FUN LOVING CRAZIES!!! Great story! Thank you so much for the happiness. Thank you so much Lenore 🙂 We all know that I’m not normal, lol! Thank you so much ;). I will relay this message … many, many times! Awe, so cute and delicious as I love that whole sweet salty thing going on. We do not have peeps in HK. I know it is so sad… I am glad my kids are teenagers now so I don’t have to stress it not having all the usual items to celebrate the season. I still hide Easter eggs though.. but instead of the the real egg we use plastic ones and put coins inside and you should see the competition between the 2 of them. Quite whimsical… I love these and pinning them now. Your peep family sure came to life with the addition ot the eyelashes and moustache (how distinguished). I can hear those babies just singing their little hearts out right now. Hong Kong – is that where your reader (Bam’s Kitchen) is from? Wow. You’re famous world wide. Thank you Tavette 😉 Bobbi from Bam’s Kitchen does live in Hong Kong … the internet is an amazing thing!